Basements can be some of the most under-used spaces in houses. Think about it: the foundation, walls, and floor in your home are already there. It is already attached to your home. You probably use it for storage and that’s about it. So if you’re looking around your lower level and wondering why you’re not using all of that extra space, then it’s time to call us for an exciting basement remodeling Burnsville project. We serve Burnsville and the surrounding areas, and we’ve helped many of your friends and neighbors with their basement remodeling projects. When you contact us for information about basement remodeling, we can guide you through the entire process. And if you aren’t sure what you want to do with that space, we can also help you with that! It may be strong>adding another bathroom, or an eat-in small kitchen area. You can be as creative as you want with your new basement. Do you just need a space to get some work done? Then maybe a home office is your best bet. Or maybe you want a space where you and your family can hang out and enjoy some time together. Then maybe you need a home theater and playroom. You can also turn that space into anything from a guest room or suite to a party room. We can even build you a wine cellar! Just let us know what you’re thinking and we’ll take it from there. When you call Titus Contracting for more information about basement remodeling, we can meet with you at your home and take a look at the space. We will discuss your wants and needs, and from there we can design a space that will suit your needs. After that, we begin the remodeling process. We will take care of hiring any subcontractors and we will also take care of getting any necessary work and construction permits. You get to take care of the fun stuff – picking out carpeting, paint and new fixtures for your new basement space! And if you are upgrading your existing porch its an ideal time to extend your basement’s square footage. And you can rest easy knowing the professionals here at Titus Contracting are on the job. From start to finish, you will always know where we are in the basement remodeling process. We pride ourselves on our high-quality craftsmanship, and we use only the best products. 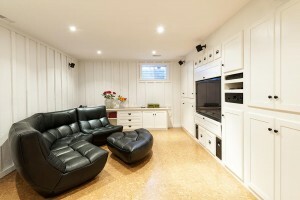 Why don’t you give us a call to see how we can help with your basement remodeling project? Are you ready to learn more about basement remodeling in Burnsville? Basement Remodeling: Let’s Get Started!